I’ve heard it said that most people would rather face death than speak in front of a group. I wouldn’t necessarily go that far, but… public speaking is not my favorite thing. Many years ago, I was in a teen pageant. I made it to the finals because of my speech. I had given the speech in a room with 5 people, piece of cake. That night, I walked out onto the stage of an auditorium, filled with people, and began my speech. “America vast and beautiful…” That was it… the rest of the speech completely left my head. There was nothing. UGH! I started over and managed to muddle through it. Needless to say, I didn’t win. Feeling totally embarrassed, and completely humiliated, I vowed never to speak in front of a large group. Of course, these days it’s a distant, though vivid, memory and a funny story to share. Having decided to become a life coach and encourager of others, I have been put in a position to speak in front of groups of strangers. I knew it was time for me to face my fear, but before I did that I wanted to be well prepared. SO I did some research. I joined a local Toastmasters Club that has helped me to become more comfortable with public speaking. They are a very encouraging group, and I have tried out some major presentations on them. If you are one of those, “I’d rather die than speak in front of a group”-type people… perhaps you would be interested in finding out how Toastmasters can help you become more confident, not only with public speaking, but also with leadership skills. 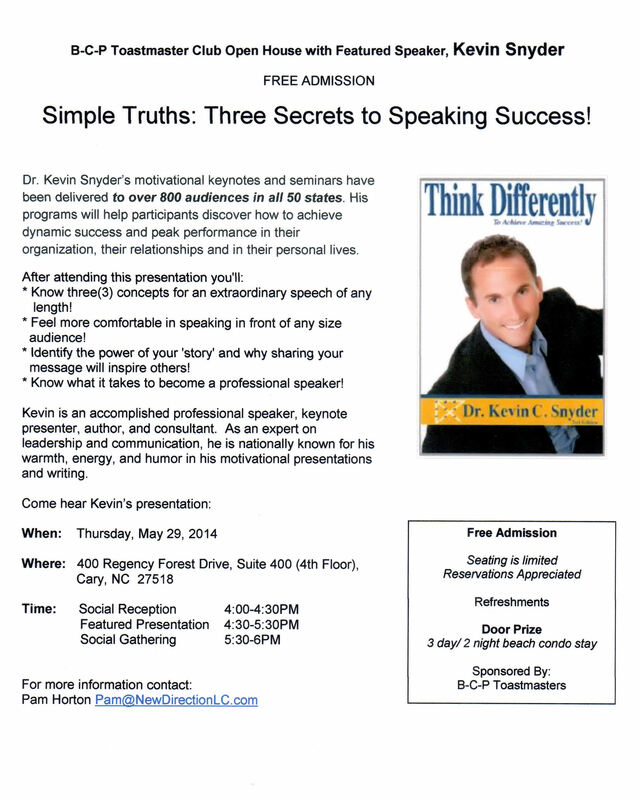 If you are in the Raleigh area…BCP Toastmasters Club will be holding an open house on May 29th from 4-6PM. Our featured speaker is Kevin Snyder. There will be refreshments and amazing door prizes. If you’re not in the Raleigh area, you can find a club near you at Toastmasters International. Is it time for you to step up – face your fear – and take a stand? Be prepared. You GOT this! Hey there! I’ve been following your website for a long time now and finally got the bravery to go ahead and give you a shout out from Huffman Texas!